We print rip cards using high quality paper, ink, and coating finishes. Add a special touch to your detachable rip card! My order came as promised. Joseph was great to work with and made sure the print met my deadline. I will use them again! Extremely high quality, will definitely be re-ordering from you guys. Thank you for the fast delivery too! Good and fast service, excellent quality. We ordered here several times and were always satisfied with the results. Rip Card Printing That Is Affordable! Full color rip card printing is a great way to direct customers to your establishment. Quality rip card printing allows your targeted audience to tear off your perforated business card from a rack card and take it with them for future use. Allow Printing Center USA to print your next advertising rip card printing project using our high quality stock and expertise. We specialize in full color rip card printing and digital rip card printing. Rip card printing prices are available for standard sizes and styles online. For the following rip card printing options 3.5 x 8.5 with a 2 x 3.5 detachable card using 100# gloss cover or 12 PT gloss cover. Print one or two sides and all rip card orders include a perforated detachable card. For custom rip card printing orders call for pricing. We offer more custom printing options then the pricing available on the website. UV coated rip cards are more durable and have a high gloss shine that emphasizes the full color printing quality. 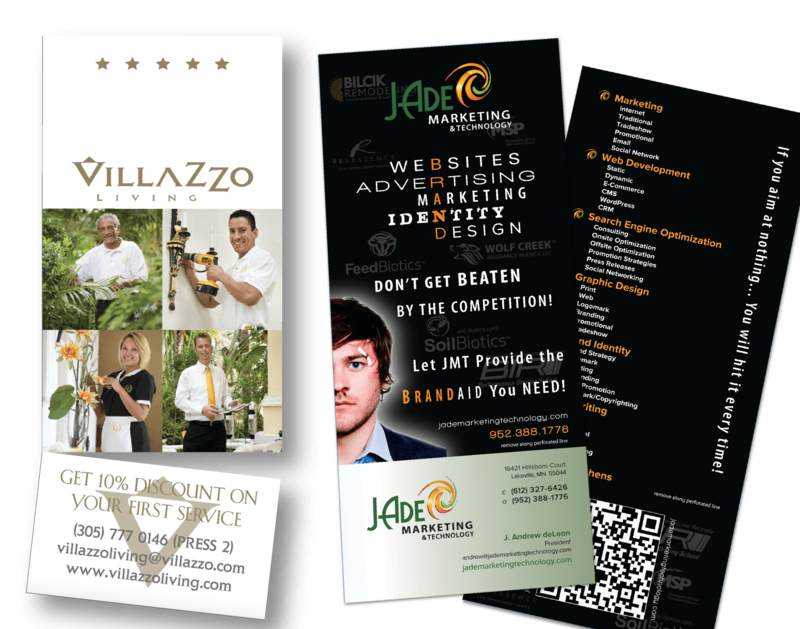 Request a sample packet today to see our high quality rip card printing first hand! Don’t want the rip card and just want a door hanger? Use our fun and FREE Online Design Tool to create an excellent door hanger that everyone will love!